In a skillet, heat the oil over medium heat. Add the carrots and onion, and sauté for 5 to 7 minutes, or until softened. Remove from the heat and let cool for 10 minutes. Preheat the oven to 350 F. Lightly coat a 9- by 5- by 2 1/2-inch loaf pan with nonstick cooking spray. In a large bowl, with an electric mixer set on medium speed, beat the eggs with the matzo meal. When well combined, add the stock, fish, cooled carrots and onion, salt, pepper and sugar, and continue to beat until well blended. Pour the mixture into the prepared pan. Pick up the pan with both hands and slam it down on the counter to settle any air bubbles. Drizzle the lime juice over the top and sprinkle with the paprika. Bake for 50 to 60 minutes, or until a long wooden skewer inserted into the center comes out clean. Meanwhile, prepare the sauce: Place the horseradish cream and cooked beets in a food processor and process until puréed. Transfer to a small container, cover and refrigerate. Remove the terrine from oven and let cool for 15 minutes. Wrap in aluminum foil and chill overnight. Loosen the sides of the terrine from the pan by running a knife blade along the edges. Invert the terrine onto a plate, and then turn upright on a platter. 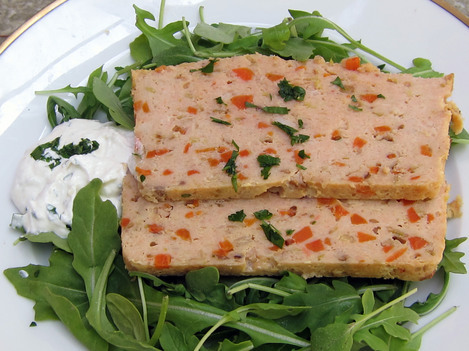 Slice the terrine into 3/4-inch slices. Garnish with lemon slices and parsley and serve. Pass the beet-horseradish sauce separately. Can be prepared up to 2 days ahead, covered, and refrigerated.